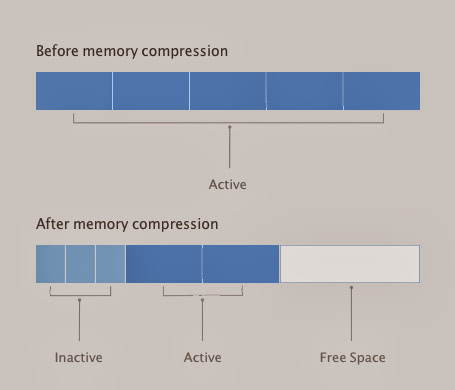 Another feature that I really like in OS X Mavericks, is the Compressed Memory. It makes my 11.inch MacBook Air a lot faster, not that it was slow before, but this feature makes a difference. You can really feel it. For example the wake up time from sleep when the lid is closed, is now totally instant. It wakes up faster than the iPad. I mean, it’s already waken and ready to use when you release your hand from the lid. Before this new feature it could take up to 3 seconds. 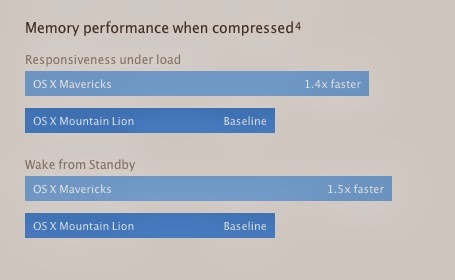 Apple says Memory Compression improves both general responsiveness under load and improves wake from standby times. With OS X Mavericks, Compressed Memory allows your Mac to free up memory space when you need it the most. When your Mac is near maximum memory, this new feature automatically compresses data from inactive apps, making more memory available for you to use. That means that the Mac doesn’t use the swap file as much anymore, and that saves both time and your SSD. So it makes the Mac able to get more done in less time. And since compressing and decompressing happens almost instantly, the only thing you’ll notice is how responsive everything feels, and as I said above, you can really feel it. It’s amazing really. The compressed memory feature makes the CPU and storage devices work less, and it saves battery as well. For me, as a MacBook Air user this is a very important feature, and it is these kinds of features that makes the OS X experience so amazing and impressive. Personally I can’t think of using any other computer than my beloved 11-inch MacBook Air.